You are currently browsing the tag archive for the ‘freezer’ tag. Cheese was on sale! The logical thing for me to do was to buy some and process it for future use because this family seems to be in an anti-cheese type mood these days. Only thing left to do was to shred it and freeze it so we can just pull as needed from the big deep freezer. 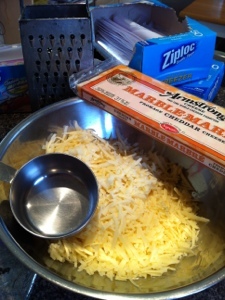 Since someone pointed out to me that the pre-shredded cheese you buy at the grocery store has a powdery substance added to it, I have been waiting for a sale on cheese to make my own. At least I know it’s just cheese. Tip: to shred your own, chill the blocks for a good hour before shredding, to make it easier on yourself. While the cheese was chilling, I started prep by labeling my baggies with the amount, type of cheese and date it was frozen. I used sandwich sized Ziploc’s. 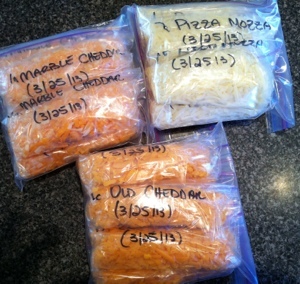 I chose to freeze the cheese in 1c portions as most recipes call for that much if not 2c at a time. Also, I only use about 1c of cheese when I make homemade pizza 😉 Each 500gr block made bout 6 cups loosely packed. 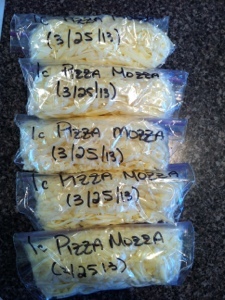 For some reason my pizza mozzarella only made 5c – maybe it wasn’t as chilled as it should’ve been? Once all the cheese was bagged with the air squished out (remember, air is the enemy in the freezer), I rolled/folded the excess bag over to make lil logs. 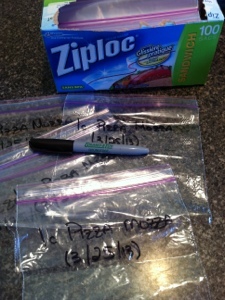 I placed all them sandwich bags into a medium sized freezer Ziploc and tried to squeeze all the air outta that bag. Voila! 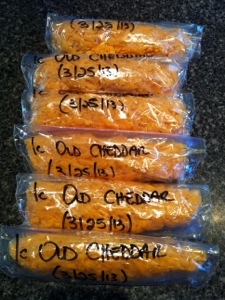 I now have 17 x 1c portions of cheese ready to be pulled at a moment’s notice. 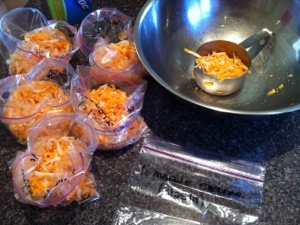 The other bonus, the one freezer Ziploc takes up much less space then one of those pre-shredded cheese bags. Do you process your own cheese to save money as well? With summer slowly nearing its traditional end (hello, Labour Day anyone?) I find that this is the time where everything starts coming in like crazy from the garden. 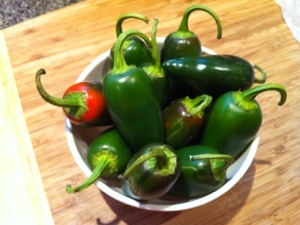 I know we had jalapeno’s growing but not like this! Last year’s crop was nothing compared to this years – they’re coming outta our ears! I’ve been looking for ways to ‘save’ them to be used in colder months and I thought about pureeing them and freezing but wasn’t too keen on that. A few other sites suggested drying them out and chopping them up as needed. That won’t work here as while trying to ‘dry them out’ they’d probably go moldy as its still pretty humid. I dawned some rubber gloves and got to slicing. I figured rounds were the quickest and easiest way to go. 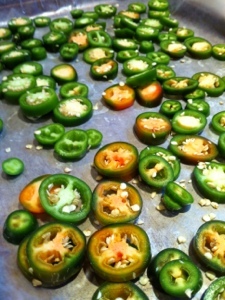 I laid out the rounds on a lined cookie sheet – seeds & all – to be flash frozen before bagging. 1 hour in my deep freezer did the trick. NOTE: be sure to have a box of baking soda in there as well as the smell will start to permeate everything in there thats already frozen. 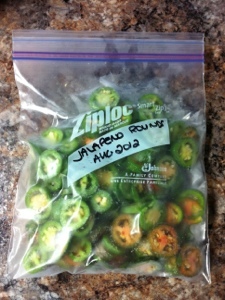 Jalapeno smelling ice cubes anyone? Once frozen, label & bag them. By flash freezing, this allows you to take out as many pieces you’d like to use as needed. For some reason, this year’s crop is super spicy. The darling hubster, lover of all things spicy thought they’d be very mild like the kind you get from the grocery store. He took a bite of a tip and cried out from his sudden & intense endorphin rush. So, um yeah…if he’s dying after having a taste without seeds – imagine how potent these lil puppies will be WITH them! I plan to do this with the rest as soon as they’re ready to be picked.